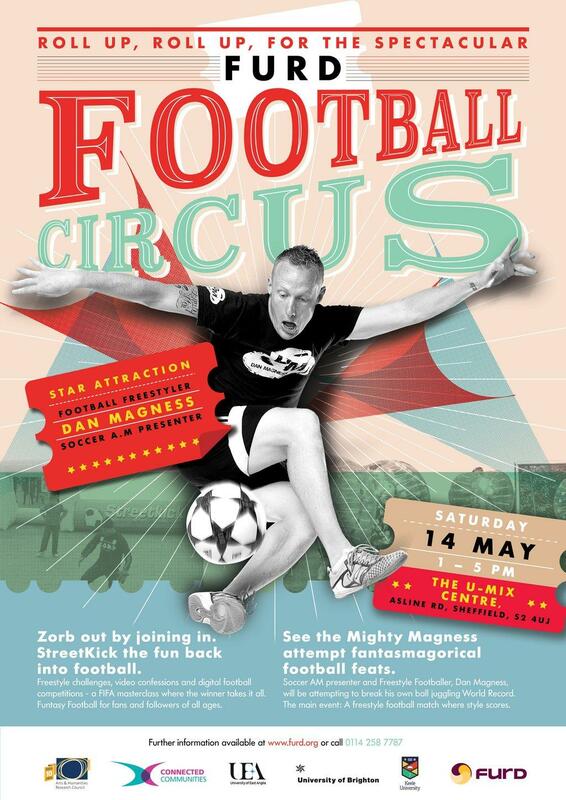 FURD Football Circus – Sat 14th May @ THE U-MIX CENTRE | IT'S HAPPENING IN HEELEY! Football Unites Racism Divides (FURD) will be hosting a Football Circus at the U-Mix Centre on Saturday 14th May, from 1-5pm, after a collaborative project with the universities of Brighton, East Anglia and Keele. Funded by the Arts and Humanities Research Council as part of their Connected Communities programme, ‘Football and Connected Communities’ has shown that many youngsters enjoy watching, tagging and sharing YouTube clips of freestyle football and then trying to emulate such feats in their own play. The main event at the Football Circus will therefore be a freestyle football match made for showboating, in which points are scored for aesthetic performance – tricks, flicks and individual skill as well as scoring goals. There are also numerous other challenges throughout the day, including keepy-up challenges, Head Tennis and Football Golf. Football freestyler, world record holder and Soccer AM presenter Dan Magness will be there, attempting to break one of his own world records and showcasing his skills for the crowd and there’ll be FIFA competitions on the X-Box.